What do you do when you have a lot, and I mean, a lot of herbs? 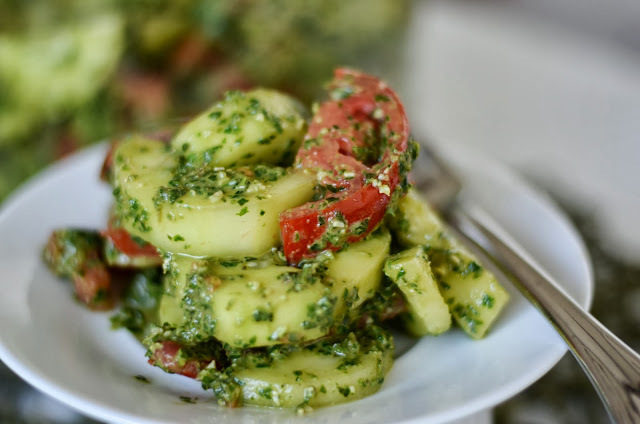 Make an herb pesto to go with a cold summer salad of course. This combination was perfect with the mild cucumber and sweet tomato. Yeah, I have an abundance of those too. Another subtle flavor in my summer herb pesto is lemon olive oil. It definitely is worth it, so seek one out. If you live in the Des Moines area, go visit AllSpice and pick up a bottle of their Eureka Lemon Olive Oil. Put the garlic, herbs and pine nuts in a food processor. Pulse until the pine nuts are broken down to small crumb size, scraping down the bowl as needed. Mix the lemon olive oil and olive oil together and then slowly drizzle into processor while blade is moving. Continue to scrape down sides and mix until the pesto is creamy. Fold with your favorite summer vegetables. You can freeze this as well. Put in a jar and lightly cold with olive oil, leaving about 1/2" space at the top to allow for expanding in the freezer. Summer flavors all year around are a plus in my book!